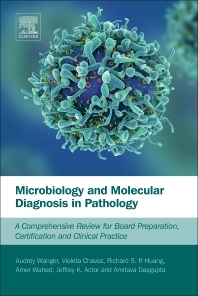 Microbiology and Molecular Diagnosis in Pathology: A Comprehensive Review for Board Preparation, Certification and Clinical Practice reviews all aspects of microbiology and molecular diagnostics essential to successfully passing the American Board of Pathology exam. This review book will also serve as a first resource for residents who want to become familiar with the diagnostic aspects of microbiology and molecular methods, as well as a refresher course for practicing pathologists. Opening chapters discuss issues of laboratory management, including quality control, biosafety, regulations, and proper handling and reporting of laboratory specimens. Review chapters give a quick overview of specific clinical infections as well as different types of bacteria, viruses, fungal infections, and infections caused by parasites. Following these, coverage focuses on diagnostic tools and specific tests: media for clinical microbiology, specific stains and tests for microbial identifications, susceptibility testing and use of antimicrobial agents, tests for detecting antibodies, antigens, and microbial infections. Two final chapters offer overviews on molecular diagnostics principles and methods as well as the application of molecular diagnostics in clinical practice.